As a guitarist, David Wish noticed that children naturally engage with music. He set out to put instruments into their hands. Little Kids Rock celebrated its 10th anniversary in 2012 with a star-studded gala in New York, honoring Steven Van Zandt. 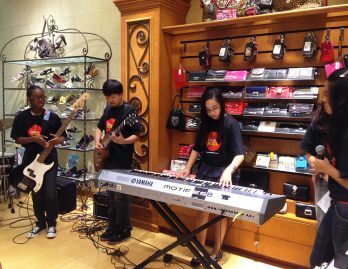 Kids from LKR perform at Brighton Collectibles, which is supporting the organization through its Kids Across America program through July. 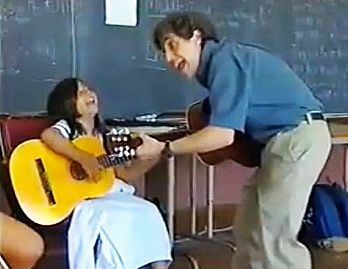 David was a first- and second-grade teacher in San Francisco when he began teaching guitar in 1996. Kids delighted in his fun approach. At the 2012 LKR gala, Aaliyah Baez sang her first composition, "Daddy's Little Girl," accompanied by Jake Clemons on saxaphone. In 1996, David Wish is watching a documentary about Django Reinhardt, the legendary French gypsy guitarist. As a first- and second-grade teacher, David particularly notices a group of little kids learning the instrument from Reinhardt just by watching him play it. He decides to teach his own students that way, and uses old guitars donated by musician friends. From his one San Francisco class, David keeps at it until his program develops into Little Kids Rock in 2002. The nonprofit organization, dedicated to transforming children’s lives through popular music education, now reaches about 107,000 kids in a thousand schools. 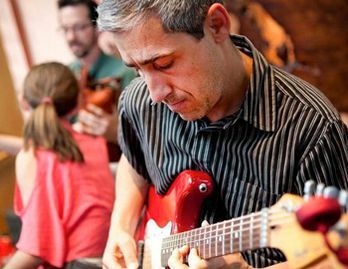 Music teacher John Flora has an immediate affinity for the LKR approach since he taught himself piano and guitar the same way. His spirited LKR program at Franklin I. Williams Middle School in Jersey City attracts a dedicated, diverse group of kids. In 2009, he meets Aaliyah Baez, a sixth grader who spends a great deal of time in his practice rooms. Before choir and during lunch, she sits by herself writing in a notebook. Even after the bell rings, ending a period, she doesn’t want to leave. John only learns what she’s writing about a year and a half later. When Aaliyah Baez sang at LKR's gala, it was the first time she performed before a live audience. When John’s stepfather dies, Aaliyah hands him a big card and offers her condolences, saying that she knows how he feels. He tears up as he reads her thoughtful card, amazed that a12-year-old is making him feel better. In that moment, he realizes that Aaliyah’s notebook must be filled with feelings about her own dad. He still has her card and the paper on which she wrote a poem about a fateful night. At about two in the morning on March 7, 2006, Aaliyah wakes up, hearing a big crash in her living room. When she goes to investigate, she sees her dad lying on the floor. He had an asthma attack and was reaching for his nebulizer. In shock, she screams for her mom. After the paramedics take him to the hospital, Aaliyah sits with her older sister, waiting for him to come back. She’s only eight years old, but she’s completely aware of the circumstances. When the front door finally opens, she sees her mom crying uncontrollably and knows her dad isn’t coming home. He was 41 years old. Through LKR, Phil Cruz began to make friends. When he's on stage, he's not a shy little nerd. With him gone, she no longer has a male role model, and in many ways, John develops a father-daughter bond with her. He encourages her to turn her poem into a song. Even after she graduates, she invites him to concerts at her high school and comes back to mentor the younger students. That sort of camaraderie goes a long way towards teaching kids to respect each other. Her middle school principal, Edwin Rivera, says the best way to combat bullying is to get kids to collaborate on something they love doing. That’s certainly the case for Phil Cruz, whom his mom describes as a “shy little nerd.” Growing up near Tampa, Florida, he has very few friends and is routinely picked on by a handful of bullies. They harass him on the school bus, and one even pushes him down the bleachers during PE class. Things start to change after he joins the LKR program at Gibsonton Elementary School. The teacher, Bob Johns, recently received donated guitars. Phil is playing drums at the moment – or “hitting cymbals, bothering the crap out of my parents,” as he puts it, but he knows some guitar, too. When he joins the program, he realizes that he’s in fact far more advanced than the other kids. For the next couple of years, he acts as a sort of assistant to Bob and makes a lot of new friends.